INTI International University has added spice to its BSc (Hons) Physiotherapy programme with an opportunity for international exposure through clinical training in India. Clinical posting at Father Muller Medical College (FMMC) in Mangalore offers students a fresh perspective on four areas of clinical practice: Cardiorespiratory, Neurological, Musculoskeletal and Paediatric Physiotherapy. INTI students with their FMMC counterparts in India. 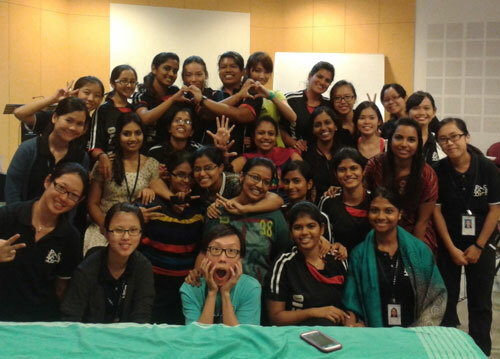 “It has been an exciting two months where I’ve been exposed to a good learning environment under the auspices of experienced lecturers and staff, master’s students, interns and fellow degree students,” said Choo Khai Shuan, one of 10 INTI students who recently completed their clinical training in India. “In India, I was frequently amazed by their approaches; for example, early mobility is emphasized where patients are encouraged to sit up, stand and walk the second day after surgery. I’ve also witnessed patients with complete spinal cord injuries regain their mobility through physical therapy and intensive rehabilitation,” said Lim Lye Hui. The students also got an opportunity to participate in a 3-day Maitland-based Manual Therapy Workshop conducted by Dr Steve Milanese from the School of Health Sciences, University of South Australia, who was an external resource person for postgraduate students in FMMC. They were introduced to a concept of evaluation and management of joint dysfunction which emphasizes on clinical reasoning, continuous analytical assessment and a total commitment to the patient. FMMC is a unit of Father Muller’s Charitable Institutions, a registered society sponsored by the Catholic Diocese of Mangalore. It offers postgraduate and undergraduate degrees in health sciences affiliated to Rajiv Gandhi University of Health Sciences, and is accredited with ‘A’ grade by the National Assessment and Accreditation Council (NAAC) of India. “Due to its success and popularity, we have developed a continuous plan for students’ clinical posting at FMMC. Another group of students has recently departed for India for their training from June to August 2014. This opportunity for international exposure will not only broaden their perspectives but also help them improve their teamwork and communication skills as they interact and form friendships with people of different nationalities,” said Praveen Jayaprabha Surendran, Head of Physiotherapy Programme at INTI International University. “Students’ welfare is taken care of by the clinical coordinators of FMMC and regularly monitored by us at INTI. Quality is ensured by both institutions as we monitor students’ progress throughout the clinical placements and the final clinical examinations are conducted professionally as required by the programme,” said Kalavathy Sriraman, INTI’s Clinical Coordinator for the physiotherapy programme. At INTI, where emphasis is placed on practical training, physiotherapy students undergo clinical placement hours at hospitals totaling over 1,200 hours, or 20 per cent higher than the clinical hours prescribed or recommended by the Malaysian Qualifications Agency (MQA). The academia of INTI provide high quality teaching and learning in a research led environment along with promotion of theory, clinical practice and research as its closely knit activities. This has ensured 81% of INTI’s physiotherapy students achieve a Cumulative Grade Point Average (CGPA) of at least 3.0 throughout their assessment in the past year. For further information on INTI’s BSc (Hons) Physiotherapy programme, call 06-7982000.